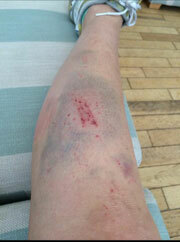 So I go for for a final wee tootle the Sunday before the marathon – and I bl***y fall!!! What the hell’s wrong with me?! I must have a death wish! Off I go to another appointment with my now bestie, Elaine at Cowal Physiotherapy, for a pre-run massage (Morven swears by it – good advice I think 🙂 ). Elaine exclaims, “God, I’m feart to touch you” – ha ha. She works her magic, tapes me up and gives me spare tape just in case. 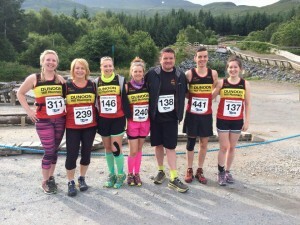 Everyone’s buzzing, Morven’s like a mother hen clucking around and making sure everyone’s OK. Oohhhh, here we go … OMG Fortwilliam 2015 … 26.2 miles and 300 runners …GO! 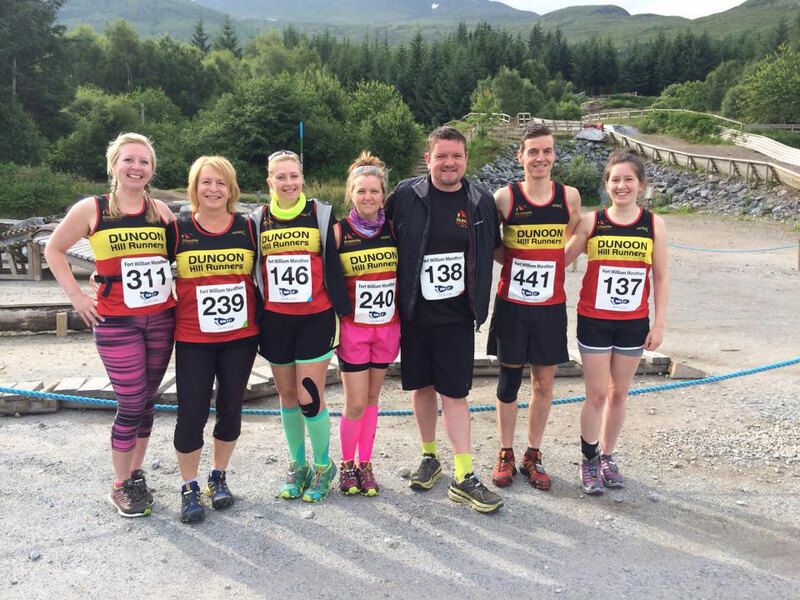 The nerves subside as we start running and Jean, Emmerson, Jamie and I ease into the run. There were two Americans just in front of us wearing kilts and three girls wearing orange t-shirts which we follow the whole way. Behind us is a Kiwi (she is doing a run/walk strategy like us) and a Dutch girl (I think she was Dutch). The route is lovely, very like the east side of Lock Eck in some places. We go off trail on to a housing estate and I know where I am – Spean Bridge, I tell the others as we cross the road and over the bridge then up the hill before turning left back on to forest trail where there are lovely old ruins, of a bridge I think! 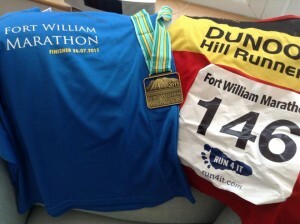 Mile 12 saw us running uphill towards the Commando Memorial monument. We see and hear the DHR groupies whooping and cheering which is a great boost as I’m starting to feel it, and my shorts are starting to chafe a bit. But Jean’s got Vaseline – pink Vaseline! Oh well, needs must. Don’t think she wants it back! Mile 13 … time for a selfie, and a rare moment – Jamie smiling! To be fair, he’s been in a great mood – no moaning at all, just punching branches for some unknown reason. We head along the canal and there’s a lot of really nice boats with people on board, all waving as we run past them and, up front of us, the Kiwi again. We’ve played cat and mouse with her for the last 13 miles and, quite frankly, I’m getting fed up with the same banter (“Good luck, you’re doing great, see you at the finish line”). So we pass her again at the end of the never-ending canal. “Whoop whoop!” Emmy shouts at mile 20. OK, only 6 miles to go as we turn on to road towards the brewery in Fort Bill. I’ve got a blister or two that I’m trying to ignore and I’m running slower than a snail as a car comes round the corner and it’s the family. John has gathered my troops and driven them up. Darcy is shouting her head off and Oscar is jumping up and down shouting, “Mummy, Mummy!”  So that boosts me for a bit longer. But the road is never ending. Jamie asks, “Will we walk for a bit?” … mmmm, where’s the Kiwi, because if I’ve got to pass her again I’m gonna bludgeon her to death with my bottle of water  Best keep moving! Meanwhile, up front, the three girls in orange spy us and start to run again. Right, let’s take them – which we do. Yeah, we’re on a roll and Mrs Kiwi is nowhere to be seen  Up over the railway bridge and – hallelujah – we’re back on trail. 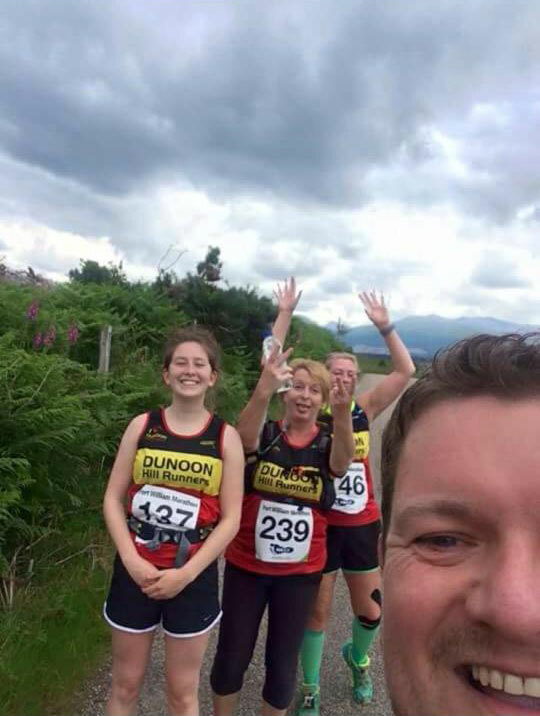 Two to three miles to go – I’ve lost count, I can’t remember – we run past the last water stop and the ambulance driver shouts something which he obviously finds funny. I cant even repeat what Jean said as we run up the hill after Quasimodo, but we cant catch him. He’s a pro and he’s hobbling faster than us. OK, last mile … mile my a**e, it went on for ever! Through the forest we can hear noise – we’re nearly there. Yeah, “Just round the corner!”, is the cry from all of us, then, “OFFS up hill again – they’re having a laugh!”. Final downhill and around the corner, we all hold hands to run to the finish. Wee Darcy and Rowan come running up to run over the finish line with us and we’ve done it – first marathon in the bag! I’m knackered, but have no new injuries except a few blisters. Result!